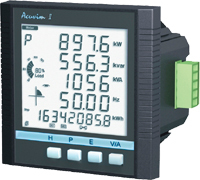 Acuvim Power Meter, 3-Phase Switchboard. 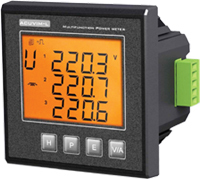 A Smart three phase Switchboard power meter features ease of installation, multiple phase display. Plus the economy of replacing single function analog meters with multifunction digital. 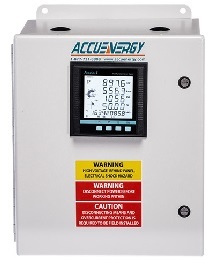 Three Phase Economical meters with optional Alarm Relay and single Communication port. All L series meters measure harmonic distortion to the 31st. Optional Web Access communication. Emails alerts. Hi end three phase meter with multiple communication ports and Analog and digital outputs. enclosure mounting. Choose from NEMA 4 and NEMA4X. enclosure. The ultimate inweather and environmental safety. AcuPanel comes completely wired and ready to mount. All data is accessible via an RS485 serial port. 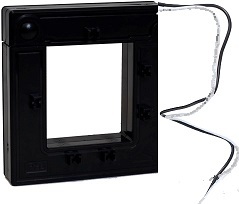 AcuSplitCT Series 1A and 5A Output Split Core Current Transformer. and easy installation without disconnecting cables during installation. AcuCT R Series Split Core Current Transformers. High Specification, Press Open Split core CT.
Pre Cut 93x93mm front door for all Acuvim meters.